The trend of declining growth in the number of Indian students flying abroad to study in the US, is expected to continue in 2019, say overseas education players. 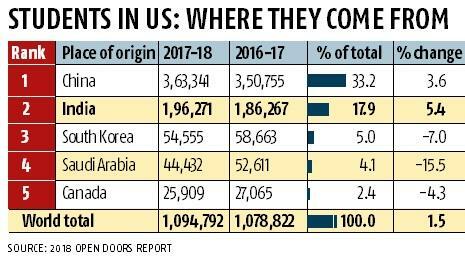 Even as more and more Indian students are going to the US for studies, the growth rate has been falling since couple of years, thanks to the economic and political uncertainty in the host country. With most of the applications having been filed by December, January is expected to see varsities reverting with confirmation of admission, which goes on till April. With the likelihood of a regime change in the US after the next presidential elections, overseas education providers and education experts believe 2019 could see a final dip in number of Indian students going to the US before rising again next year. The uncertain environment for foreigners under the current regime in the US may have contributed to the dip, some believe. “Students not only want to study in the US but also want to work there — at least for few years. If students are uncertain of employment or feel the environment is hostile, then they will reconsider the decision to pursue higher studies in the US. So the policy drift in the incumbent US government has affected the student outflow from India. This is despite the US economy having bounced back in recent times,” said Narayanan Ramaswamy, Partner and Leader for Education and Skill Development Sector, KPMG India. As a result this — coupled with feedback from students already studying in the US as well as the improving job market in India — growth in number of students going to the US is set to fall this year as well, before rising again in the near future. “Lot of Indians are getting adverse feedback from people in the US who had applied in 2015-16 and are now set to graduate. People who apply in 2019 will get in college by 2019-20 and graduate by the time new regime comes in. Since technology and consulting sectors in the US cannot do without India, there is a hope that things will change if a new regime comes in. Hence, we may see a dip in growth of Indian students going to US this year, followed by a resurgence next year,” said Arun Jagannathan, CEO and founder of CrackVerbal, an overseas education service provider. According to the recent Open Doors International Education Report for 2018, growth in Indian students going to the US had slowed down from a 12 per cent growth in 2016-17 over the previous year, to 5 per cent in 2017-18 over the previous year, with 196,000 students going to the US. In 2016/17, around 186,267 Indian students went to the US, as against 350,755 Chinese students, said the report. India, at 18 per cent, continues to be the originating nation for the second-highest number of foreign students after China’s 33 per cent. Analysts point to the emergence of ‘better options’ as destinations for Indians for the dip in growth to the US. According to Jagannathan, Canada, Australia, Ireland and Germany are seen as safer with lesser nationalistic moods and wider embracing of foreign students. Further, with more number of institutes accepting GMAT scores, students who having trained for studying abroad would also want to stay back. “We anticipate a 50 per cent shift in Indian students to the low and mid rung campuses in the US and 30 per cent at top campuses to other destinations like Canada, Australia, Ireland and Germany,” said Jagannathan of CrackVerbal, which caters to 2,000 students (but indirectly engage with 10,000) wherein 60-70 per cent of students used to fly to the US for studies. However, Jagannathan anticipates the same to fall to around 30-40 per cent, with half of the difference choosing to remain in India, while rest half shifting to other destinations.